Hotel was fine, except I would have expected them to take responsibility for the booking.com error and give us the second room at no additional charge (see next section). Last Year dinner and breakfast the morning after were really good. We were there only 1 day, enjoyed a walk in the woods. Service was friendly and helpful. Rooms very clean, ours had a nice balcony with pleasant view on the hills. Wir waren mit zwei Motorrädern unterwegs. Super als Ausgangspunkt für Tagestouren auch in die Vogesen. Wir hatten das Privileg als erste Besucher im neu renovierten Zimmer zu schlafen. Die Einrichtung ist schlicht und modern - absolut solide und ausreichend. Das Personal war immer sehr freundlich, gerne haben Sie uns auch bei der Planung der Routen unterstützt. Alles in allem ein super Wochenendtrip. Deutsches Mittelklasse-Hotel ohne Besonderheiten, aber familiär, mit freundlicher Bedienung. Essen war gut bürgerlich. This family-run hotel in the Black Forest offers traditional rooms with balconies overlooking the beautiful Harmersbach Valley. Facilities include bowling, ping-pong and a children’s playground. Parking is free. 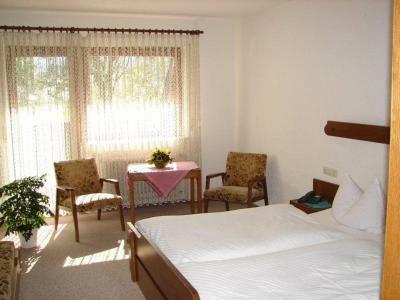 All rooms and apartments at the Gasthof Grüner Hof feature satellite TV and a private bathroom. There is free Wi-Fi in public areas. A breakfast buffet is available each morning at the Grüner Hof. 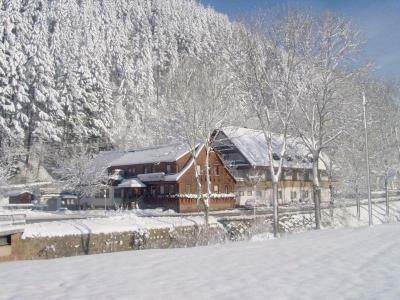 The restaurant serves specialties from the Black Forest region. Guests can enjoy the house schnapps and Baden wines. The Grüner Hof is 28 miles from the Europa-Park Theme Park in Rust. Strasbourg, Freiburg and Baden-Baden are good day trip destinations from the hotel. 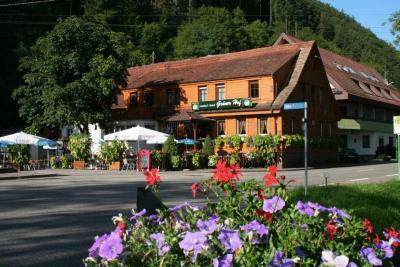 Guests at the Grüner Hof receive a ticket that offers free transportation by bus and train in the Black Forest region. When would you like to stay at Grüner Hof? House Rules Grüner Hof takes special requests – add in the next step! 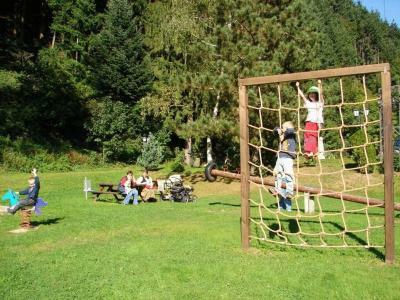 All children from 2 to 6 year are charged EUR 5 per person per night for extra beds. Grüner Hof accepts these cards and reserves the right to temporarily hold an amount prior to arrival. Staff was nice people. Breakfast is average. The restuarant are closed on mondays, I wish that could be communicated beforehand on booking.com. They did however offer to us a small menu of 4 things and drinks. There are a bowling alley but we could not use it as the locals use it exclusively it seems. Not reccomended for small kids, theres a busy road right next to the building which are not shown on photos. Booking.com could have gotten our booking correct. My confirmation email states two adults, two children. The hotel's confirmation was for two adults only. We had to pay for two rooms at opposite sides of the hotel and could not enjoy an evening together. There was a strong smell of (it seemed) fat friers from the kitchen throughout the restaurant and some of the first floor. Breakfast was very average. Decor tired. It is possible to smoke in the room.